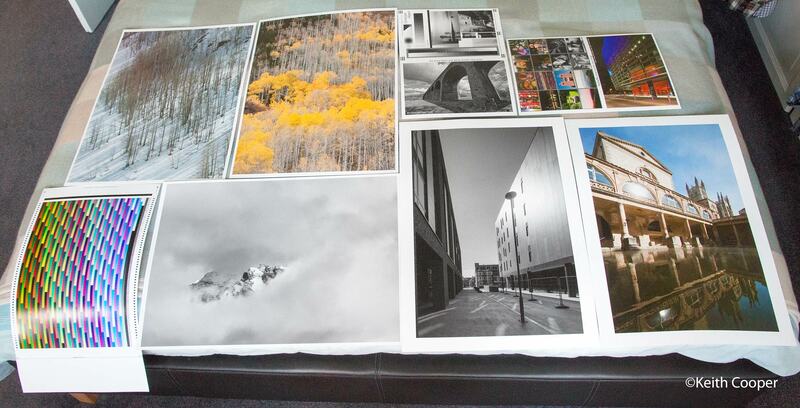 Fotospeed’s Platinum Baryta 300 paper is a heavy unglazed photo paper. Keith has been testing this paper and looks at how it performs, and just as importantly, what sorts of photos you might choose to print on it. The paper’s available in a range of sizes (A2 or 16.5″ x 23″ tested). The paper is a heavy stiff glossy paper. 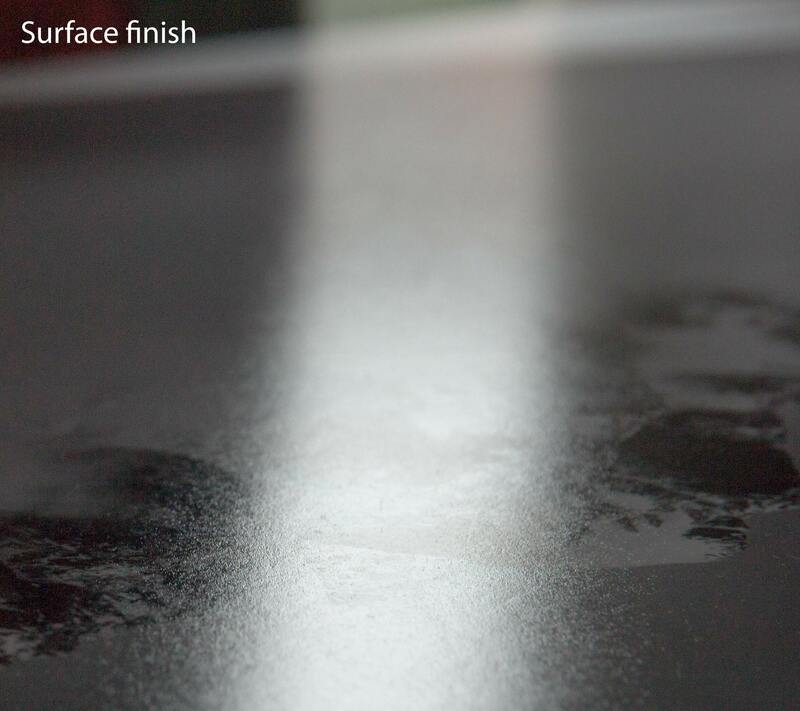 The paper is unglazed with a fine surface texture, so I’d almost call it a lustre/silk or semi gloss finish. It’s a fairly bright white, so does contain a small amount of brightening agent (see the reflection spectra in the profiling section below). However, put it next to a bright photo paper (lots of OBA) and you can see that its a very modest amount – certainly not enough to give me any longevity concerns. Before any photo printing I produced a custom ICC printer profile and checked the linearity of the printer’s black and white print mode (ABW) with my B&W test image. Since I was testing large A2 sized sheets I also took the opportunity to look again at some aspects of my image editing workflow for large prints. There are details of this in a larger prints from older files article I’ve written. 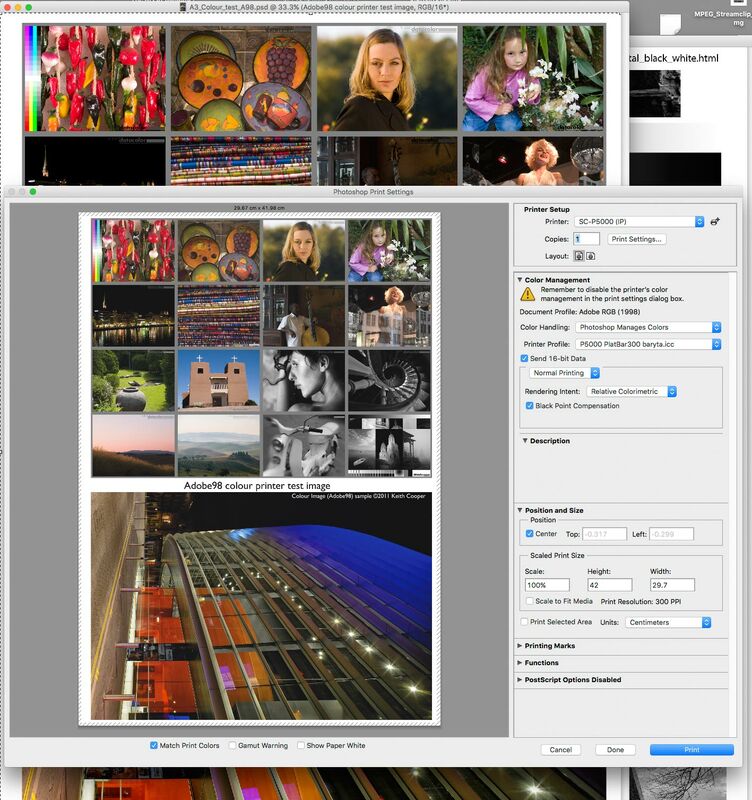 I’d note that Fotospeed will make (free) custom profiles if you buy paper. For my testing, I create profiles from rather larger test targets than most profile making services. They take a bit more work, but give me confidence that I’m getting the best from any printer/ink/paper setup. I’m using the ‘Baryta’ media setting in the P5000 driver, but if something like that is not available then I’d suggest a heavy lustre paper. 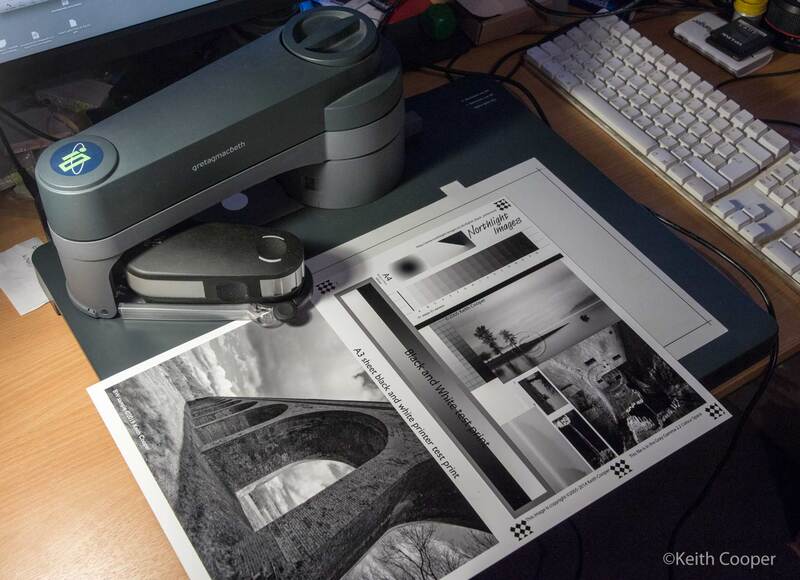 If you’re unsure, ask Fotospeed what they suggest for your particular printer. 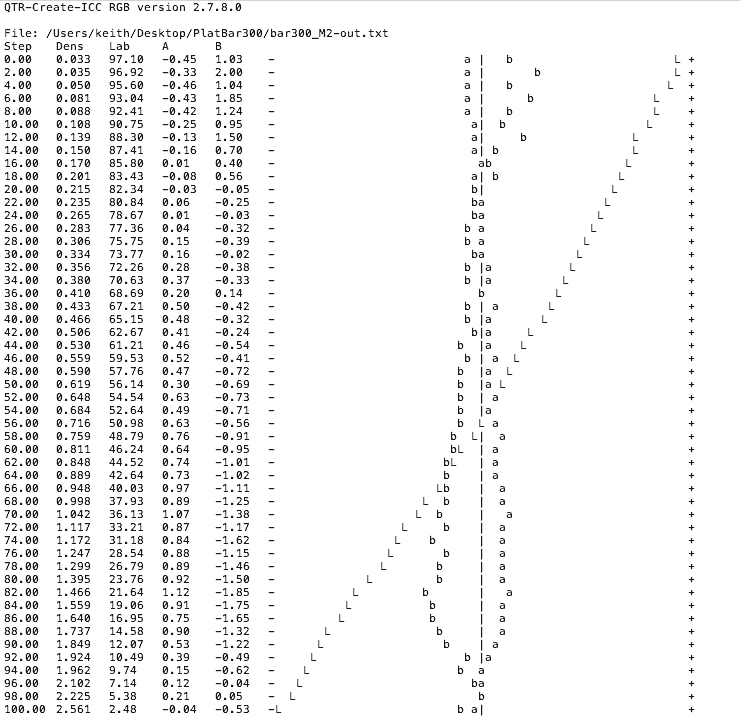 Here’s the profiling target after scanning. 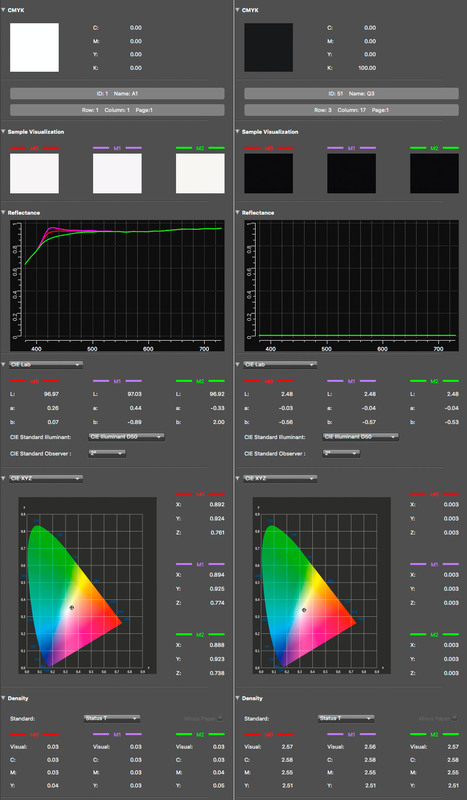 The software [i1Profiler – review] lets me check the measurement data for any of the coloured patches – I’ll come back to this for B&W measurements. After creating the profile I can print my test images. I’m printing directly from Photoshop – here’s the colour test image I’m using. 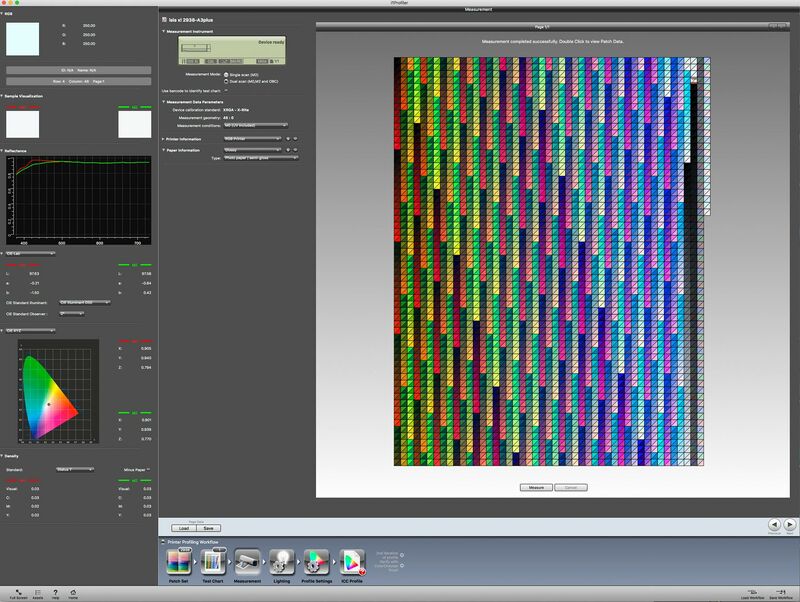 Using the Gamut warning feature, I can check if any parts of the image are out of gamut for the paper/ink/printer. The deep blues in the floodlit area are often where gamut limitations show up. However, do remember that the indications (grey areas) show where there is -any- out of gamut colour, no matter how slight. What I’m going to be examining is how the print detail and colour looks in this area. 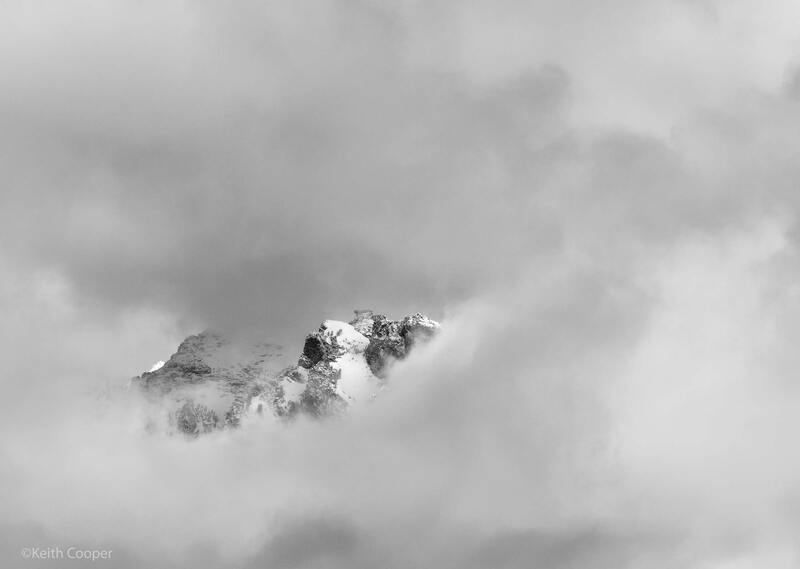 Using test images like this is a key part of my printer workflow – I’ve written a guide to better photography by printing your work that explains this in much more depth (including links to test images). I want to test black and white print quality as well, since this is the sort of paper that can give a very nice feel to B&W images. Time for another test image. 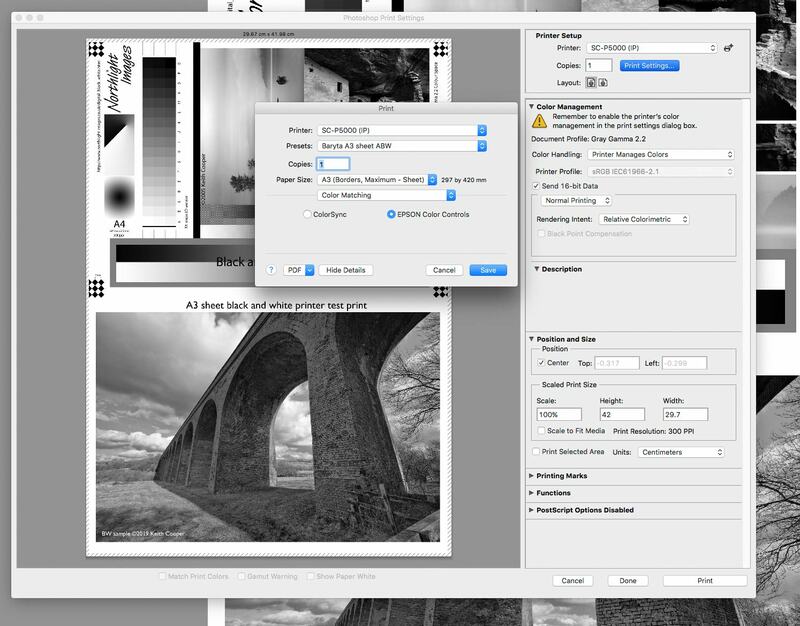 The B&W test image is one I specially created for the purpose [see: B&W Test image] and includes a section for measuring print linearity. 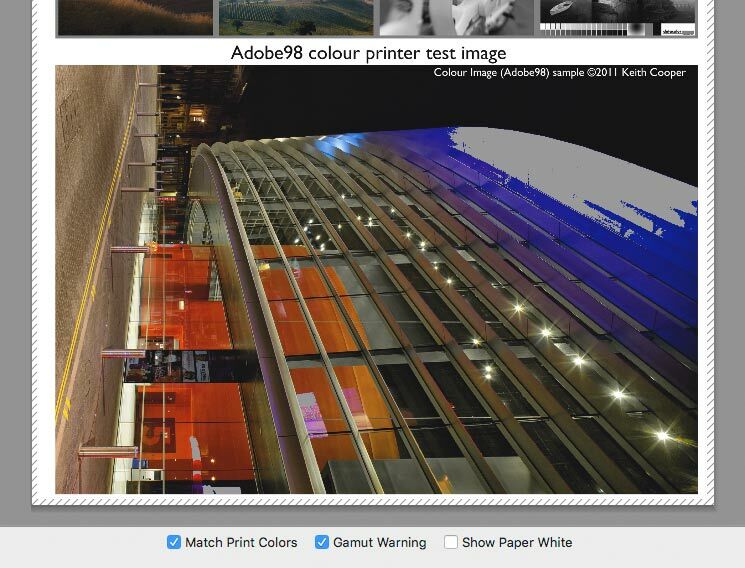 Even a casual look at the test image suggests that the default ABW settings for the print driver will be fine. 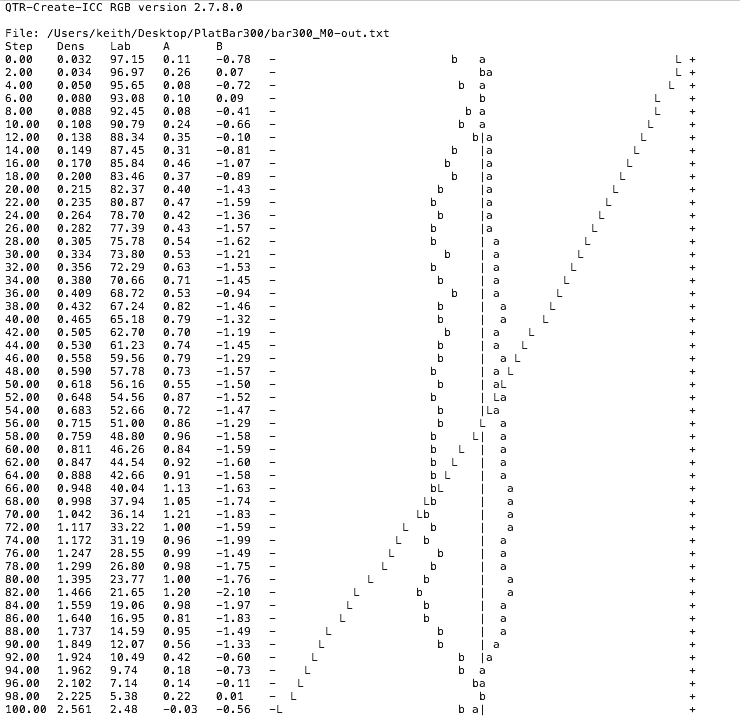 These three graphs (included for those that like lots of data ;-) ) show the linearity of printing when measured at different settings (effectively the amount of UV in the measurement process). They mean that shadows won’t get crunched up and that I need apply no corrections to my B&W image files to compensate for print non-linearity. The clear difference between steps at the dark end (100) shows me that under good lighting my prints will show good detail in the shadows. There’s one other observation from the measurements taken using my i1iO. 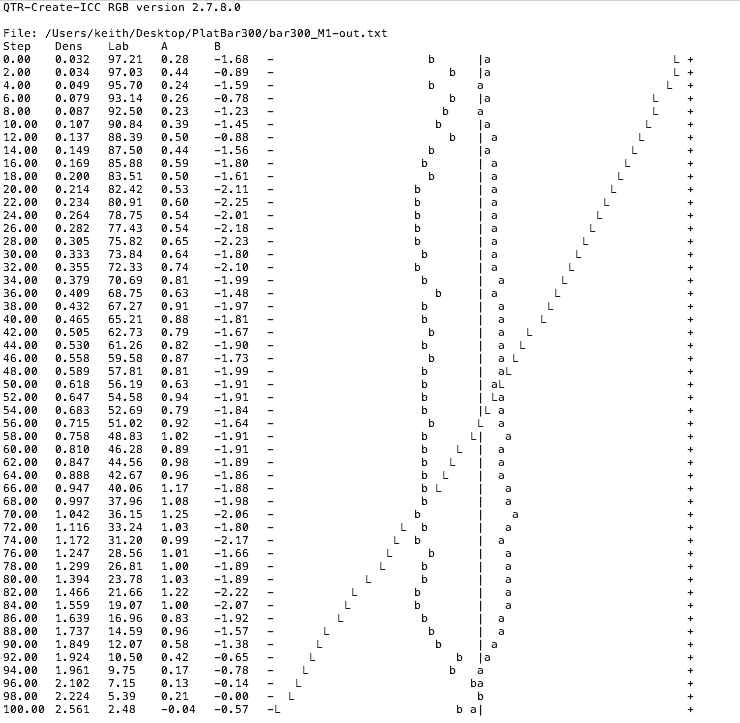 Here are the spot readings for the paper (i.e. pure white) and 100% black. The slight bumps in the spectrum show that there is a small amount of brightening in the paper, but only enough to slightly reduce the natural warmth of the baryta coating. What I’d call ‘Bright’ white papers have a huge bump at the end. These are the ones where OBA content might give concerns over print longevity. 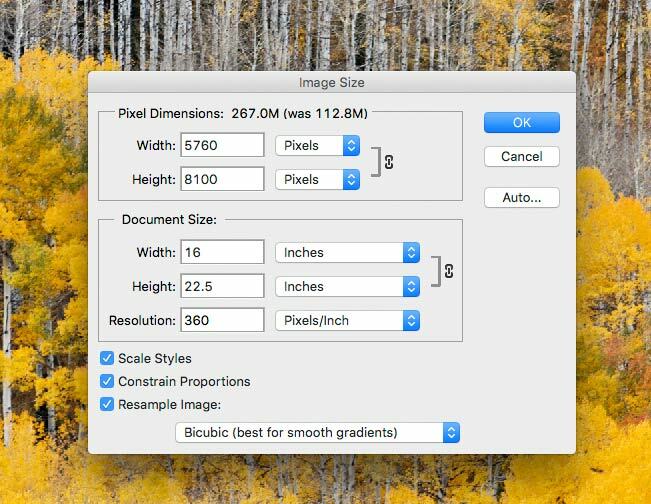 You can also see the paper (at these print settings) has a Dmax of ~2.57. Of course you might well be able to get more ink on the paper and bump that number up a bit, however that will likely reduce linearity and print quality. As I’ve said before, using such numbers to make your paper choices or compare similar papers is to me utterly pointless, and misses so much of what really matters in printing. Whilst the profiling and B&W testing gives me a lot of information about the paper, the real test is how do prints look? 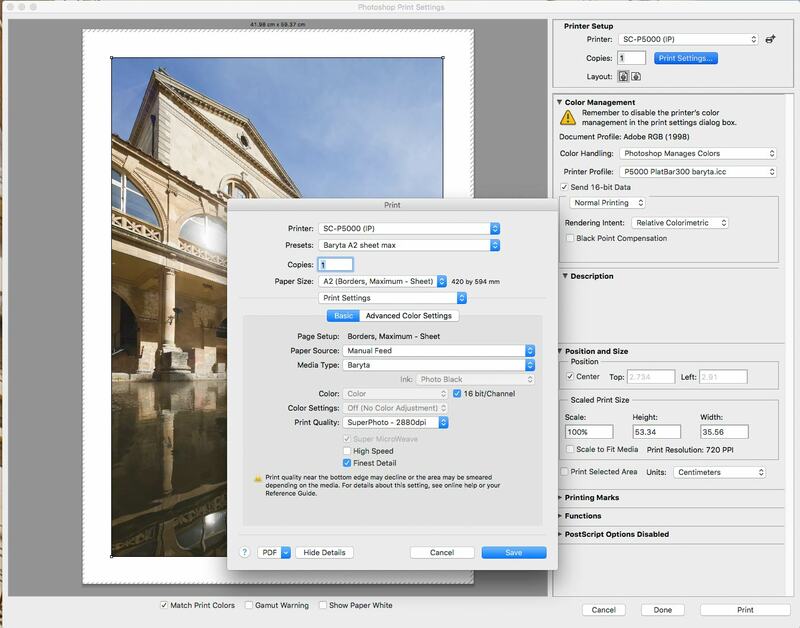 It’s a good paper and at A2 size, the print files need careful processing to look their best. Indeed, I ended up doing so much work in some areas that I’ve spun it off into a separate article about my print file preparation. This oblique shot of a B&W print is lit to show the surface texture. The reflection is of partly open curtains looking outdoors.. Of note are the lack of bronzing and minimal gloss differential. Apart from being slower to print, it just confirmed my opinion from earlier testing of the P5000 that for larger prints, the 1440dpi setting was just fine. 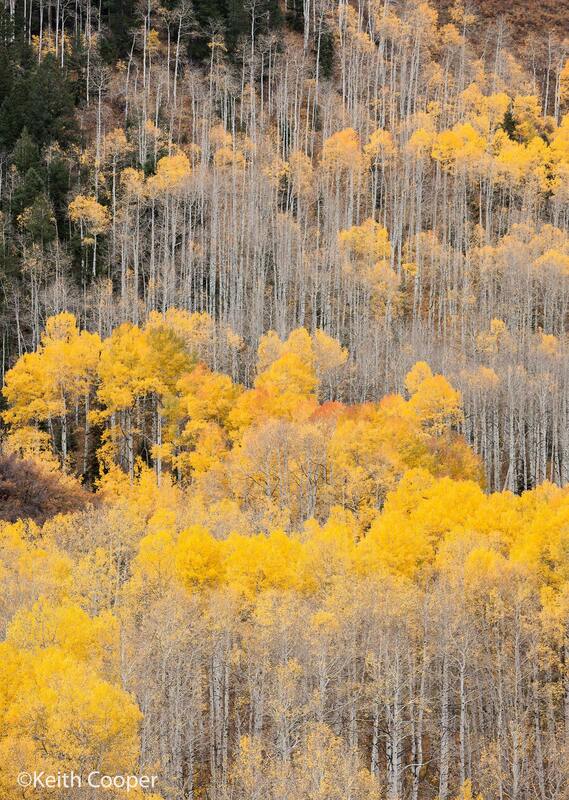 This particular image of aspens in the Fall in Colorado has a lot of fine detail. The parts that cause problems for smaller printers (and cheap papers) are the variations in bright leaf colours, and some of the dark greens/browns. Here’s a larger version of the image (click to enlarge), but remember that this image here, is in the sRGB colour space (for web use), not the larger ProPhoto space I’ve used for image editing. Two very different images give a feel for the B&W performance of the paper. The second shot needs reliable shadow detail in printing. There is texture in the shadowed areas, which could easily be lost if the paper/printer was crunching shadows. You could probably alleviate this with an adjustment curve, but it’s nice not to have to worry about it. It’s worth noting that not all monitors are good at handling deep shadow detail (even when calibrated), so don’t always rush to blame your printer/paper. This is one of those papers that just makes me want to print stuff. I get a lot of papers to try and often put them aside just for particular styles of print. 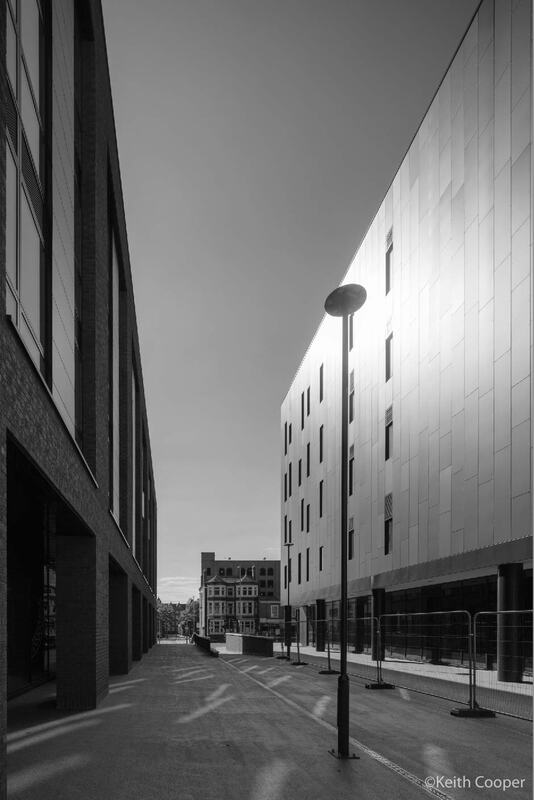 The paper is not too bright for many of my B&W images, and not too warm for the paper colour to ‘intrude’ on the image. The colour handling is good and the surface finish doesn’t get in the way – something I’m careful of with pigment inks and glossy papers. The sheets I’ve printed show no curl, either in the box, or after I’ve printed on them.